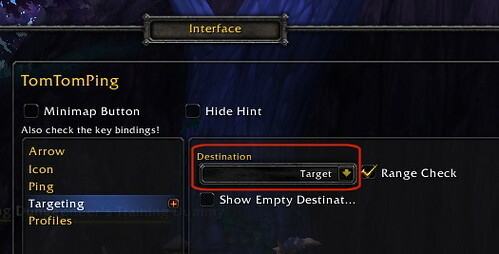 Have you ever been playing WoW and thought “I wish that there was something in the interface to help me to do this”? That is where addons come in. They are little bits of code that modify the game interface to allow you to customize how it works. Some of them are small changes and some are big changes. Some of them are very simple to use while others require time and effort to configure. These sites allow you to browse their collection of addons, provide some basic information about what each addon does and which version of the game it is compatible with (at least according to the addon author). Note that addons that are not quite up to the most current version of the game might still work, so they might still be worth trying out. In order to get those to run, you'll need to check "Load Out of Date Addons" in your Add-on panel prior to logging into the game. Once you have found an addon you want to try you can download it as a zip file. The zip file will contain one or more folders. To install the addon you unzip these folders into your WoW AddOns folder. On a Windows OS this folder is C:\Program Files (x86)\World of Warcraft\Interface\AddOns. On a Mac OS, open the zip file into your Downloads folder. Then you can just drag the AddOn from the Download folder to Interface/Addons. Once you have all your addons in the right folder, do a quick restart of your computer. Some addons, and it's not always stated in the text, need that restart to start working. Once you have started down the addon road be aware that you will probably have to update at least some of your addons each time there is a major game update. I spend a few minutes checking on addon updates each time there is a major game update. There is even a free addon management application from Curse that will do this for you, available at http://www.curse.com/client (although only the PC version is supported at this time). This might seem like a bit of a hassle, but it's worth it! The payoff is a much improved game playing experience. On Macs, if you're checking your update, look for the date the Addon was created or updated. It will be to the right in your Interface/Addon folder. Then check it with the date the Addon was updated. If they are different, you'll want to update. Do the same thing for adding the Addon and drag the update to your folder. You'll get a dialog box asking if you want to update. Click "yes" and the new version overwrites the old. For some casual players, spending a lot of time finding, installing and configuring addons seems like a big commitment. It is true that some addons do require quite a bit of time to configure. But there are also some simple but still useful addons that take little or no setup, but that will improve your game play. Here are a few that I have found that will help you during combat. Note that this is not a comprehensive list. 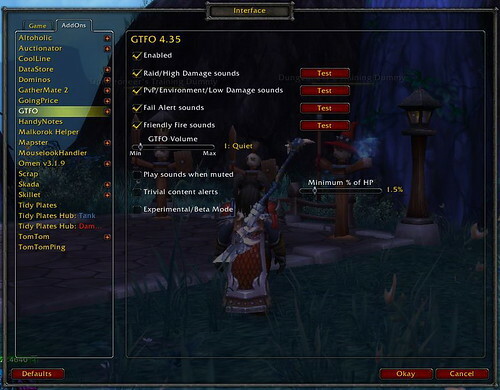 Probably the most recommended addons for combat are Deadly Boss Mods (or DBM), a DPS/Healing meter like Recount or Skada, and for healers, a healing addon like Vuhdo or Healbot. Some guilds require DBM or BigWigs. Those addons require quite a bit more commitment to setup/update/configure than the simple addons covered in this article. Get out of the fire! This addon plays a sound when you are standing in bad stuff, or just too close to someone else who is radiating bad stuff, not that any of us ever gets distracted by shiny things and stands in the fire, nooooo. I especially like this addon when I am healing, as I can get a bit of “healer tunnel vision” and miss the fire at my feet. You can use this addon without any configuration. If you want to customize it you can use the main game menu (by default press the Esc button on your keyboard) then select Interface, and then use the Addons tab and pick your addon to see the GTFO settings. · If you are a dps and you are very close to topping the threat chart you might want to think about ways to dump threat or you will be tanking next (and if you are a “dps watcher”, that is someone who lives to top the dps charts, keep in mind that a dead dps does no damage, so staying alive is good for your damage numbers). · If you are playing a class that has a pet and your pet tops the threat chart you will know your pet is generating aggro. You'll need to check if you have Growl on. It's easy to forget when you go from solo to group play and use the same pet for both. · If you are a healer and you are topping the chart, your heals might be a tad overpowered for the group you are with. If you have a “threat dumping” spell, it might be time to cast that. Or if you think you might be over healing this might be the time to do some more targeted healing instead of AOE heals. · If you are a healer in a raid and you want to know which tank is the current target, then you will be able to tell by seeing who is topping the threat chart. Omen has a LOT of settings, but you don't have to worry about them if you just want to use it for its basic purpose of showing an ordered aggro list. When it is first installed it will open in the center of your screen, so you will probably want to grab the Omen title bar and drag it to the side. Once you have it positioned where you want it you should probably lock it in position so that you don't accidentally move it during combat. To do this right click on the Omen title bar and select Open Config and check the “Lock Omen” option. While you are in the settings window you can look around, but you don't need to change anything else to use this addon. Personally I also like to change the Alpha to 70% or less, so that it's semi-transparent allowing me to see a bit of what's under the window. Many spells have a cooldown, that is once you cast a spell there is a set time you have to wait before you can cast that spell again. This addon shows a timeline bar, and each time you cast a spell with a cooldown it places an icon for that spell on the timeline, which then slides down the timeline as its cooldown ticks down, expanding to a bigger icon just as it becomes usable again. This give you a single place to look for a visual representation of how long it will be until your spells are ready again. I find this is especially nice when you are trying to get the timing right for a sequence of spells that work best together. One of those “cast A first to give a boost to all subsequent spells, then B and C”. CoolLine lets me see if A, B and C are close enough together in time to make it worth waiting for all of them to come off cooldown at around the same time. It's also nice for those abilities with longer cooldowns, where the standard spiral cooldown display just does not give enough granularity, for example, to let you see if the cooldown is 10 second or 2 seconds. TomTom and TomTom Ping are two related addons. TomTom gives you the basic functionality, and TomTom Ping expands upon that to give you a bit more. TomTom is great all on its own. It shows you where you are in the world using X,Y coordinates, and lets other people give you directions using a TomTom way point marker. If you like to look things up on www.wowhead.com, then they often give coordinates (something like: 50.6, 23.4) and you can type /way 50.6 23.4 into your chat panel and a TomTom marker will be placed on your map to show you where to go. Once you have TomTom, extend it by getting TomTom Ping, especially if you are going to group up with others. Once TomTom Ping is installed you can enable one little setting (as shown in the screen grab above), and then any time you click on someone in your group, you will be shown an arrow that points toward that person and shows you how far away they are. How many times have you been with someone and they say “come to where I am” and you can't find them? Or you are trying to heal them and they run out of healing range? With TomTom Ping as long as they are your current target you will know which way they went. Of course, if they ran right into the fire or straight at the boss, at least you'll know that's NOT where you want to go.